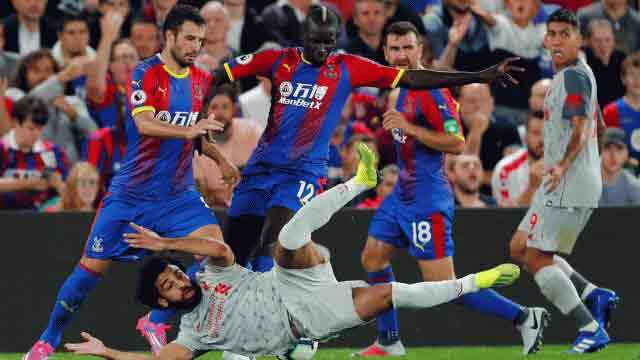 Dhaka, Aug 21 (Just News): Mohamed Salah was engulfed in a diving storm as the Liverpool star won the controversial penalty that inspired their 2-0 win over 10-man Crystal Palace on Monday. Referee Michael Oliver awarded a spot-kick for Mamadou Sakho's challenge on the Egypt winger and James Milner converted the penalty. Former Manchester United defender Gary Neville, working for Sky Sports, claimed it was a dive, saying: "A lot of people won't like it. If it's against you, you'll think it's soft. "It is a theatrical fall which we've seen a lot of players do." Adding insult to injury for Palace, Aaron Wan-Bissaka was sent off in the second half for bringing down Salah as he raced clear. Taking advantage of their numerical superiority, Jurgen Klopp's side made sure of extending their 100 percent start to the Premier League season thanks to Sadio Mane's goal in stoppage-time. Palace boss Roy Hodgson was furious with the penalty, saying: "My frustration is I don't think that's a penalty. It's cause for anger and disappointment. "I've been in football a long time. If that's a penalty the game has changed beyond all recognition. "Sakho is a defender and he has to try and defend. "There is no way he is looking to foul the player. Liverpool didn't deserve to be leading." Klopp side-stepped the diving row, claiming he hadn't seen the incident clearly. "I didn't ask Mo about that. I didn't see it. It looked like it was (a penalty), but I have no idea," he said. After Manchester City's swaggering demolition of Huddersfield on Sunday, it was important for Liverpool to keep pace with the champions, even at this early stage of the season. This was a statement win for Klopp's team, installed as City's most likely challengers, and they move into second place after building on last weekend's rout of West Ham. But Klopp refused to talk up Liverpool's title chances. "I am not interested in sending statements to Manchester City or anyone else. I want to win football games," he said. "I couldn't care less really. We are not in a race with other Premier League teams each weekend." Right from the start, Salah was in the thick of the action when he surged onto Naby Keita's long pass, but the Egyptian's chip sailed high over the bar. Andros Townsend came within inches of giving Palace the lead against the run of play when he cut in from the right flank and unleashed a superb 25-yard strike that cannoned off the crossbar. Klopp's men finally made the breakthrough just seconds before half-time. Roberto Firmino's pass found Salah just inside the Palace area and when Sakho caught him with an out-stretched leg, the Egyptian's slightly delayed tumble didn't dissuade Oliver from giving the penalty. Milner, ignoring the sound and fury, nervelessly sent Wayne Hennessey the wrong way with his spot-kick. After Wilfried Zaha's run earned a second-half free-kick in a dangerous position, Palace captain Luka Milivojevic whipped the set-piece goalwards, only for Liverpool keeper Alisson Becker to make a superb save low to his left. Salah didn't tire despite his prodigious work-rate and it was his blistering break that induced the lunge from Wan-Bissaka which triggered his red card. The young full-back, who had been left alone as the last line of defence, hardly made contact with Salah, but again Oliver ruled in Liverpool's favour. As Palace threw men forward in the final moments, Senegal winger Mane put the result beyond doubt when he sprinted clear, rounded Hennessey and slotted home.